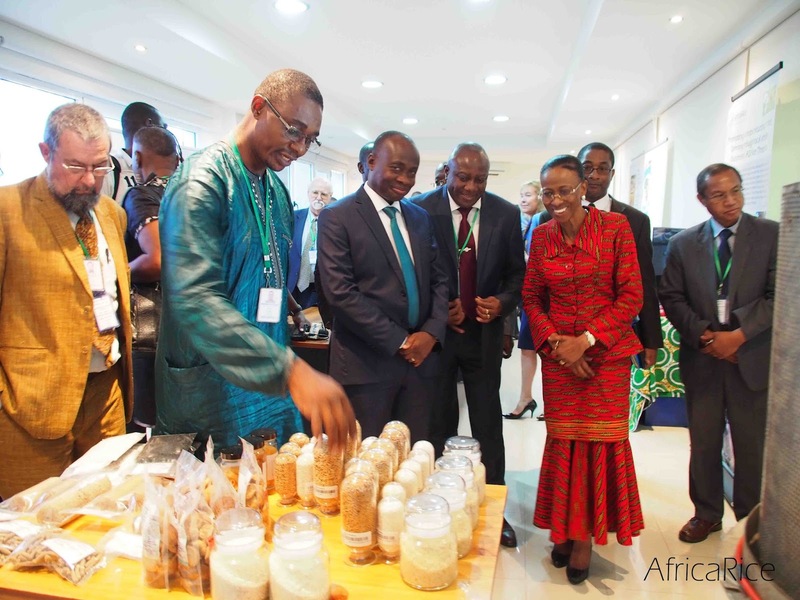 Dignitaries from the Ivorian government and the African Development Bank (AfDB) expressed their strong support for the Africa Rice Center (AfricaRice) during the 40thmeeting of the AfricaRice Board of Trustees, 7-9 September 2016, at the center’s headquarters in Abidjan, Côte d’Ivoire. The government dignitaries, who visited the headquarters on 8 September, comprised Prof. Ramata Ly-Bakayoko, Minister of Higher Education and Scientific Research (titular Ministry of AfricaRice); Mr Ouattara Wautabouna, representing the Minister of African Integration; Mr Apporture Kouakou, representing the Minister of Agriculture and Rural Development; Mr Edmond Coulibaly, representing the Minister of Finance; and Dr Yacouba Dembélé, Director General of Office National de Développement de la Riziculture (ONDR). Dr Eklou Attiogbevi-Somado represented the AfDB President. 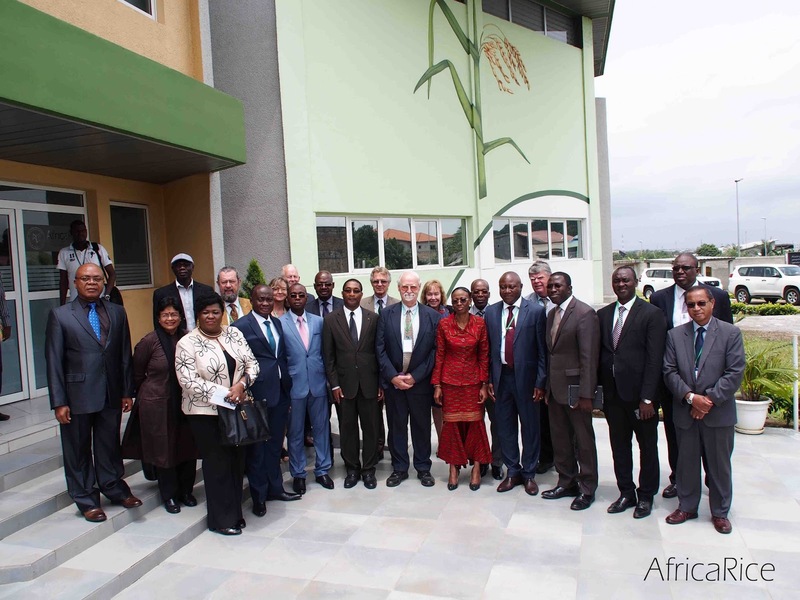 Welcoming the dignitaries, the Board Chair Prof. Eric Tollens highlighted the importance of rice as a strategic food security crop, stressing that Africa’s importation of the grain amounted to over one-third of the global trade in the commodity. AfricaRice Director General Dr Harold Roy-Macauley made a presentation on the strategic response of AfricaRice to the vision of the President of Côte d’Ivoire, H.E. Mr Alassane Ouattara, on self-sufficiency in rice production. In response to the Director General’s presentation, the visiting dignitaries expressed their deep appreciation and solidarity with AfricaRice’s strategy. Prof. Ly-Bakayoko expressed her happiness to have been invited to address the 40th Board meeting. She characterized the Board as a prestigious governing body that comprised experts in various fields of endeavor from across the globe. She also commended her colleague ministers for sending their representatives to the meeting. The Director General of ONDR briefly narrated the long history of fruitful partnership with AfricaRice on the provision of high quality seed, capacity strengthening, rice value chain development and youth employment. Mr Kouakou, representative of the Minister of Agriculture, commended AfricaRice for strengthening the synergy with national scientists, and pledged his ministry’s continued support to the efforts being deployed by the Center. The representative of the Minister of Finance echoed the existence of highly significant rice markets in Côte d’Ivoire, and in the region. He stated that Côte d’Ivoire should go beyond self-sufficiency to rice exportation to these markets. Dr Attiogbevi-Somado, representing the President of AfDB, thanked AfricaRice for its clear response to the President Ouattara’s vision on rice self-sufficiency. He observed that AfricaRice’s response was in line with the vision of AfDB on agricultural transformation in Africa. Mr Wautabouna, representing the Minister for African Integration, on his part encouraged AfricaRice to keep up the good work being done in Africa generally, and in Côte d’Ivoire, specifically. As part of the regular Board proceedings, the Board Chair Prof Tollens gave a report to the Board on his activities since the Board’s last meeting in March 2016, following his assumption of office. The Board Chair’s activities focused both on issues that were directly Center-related and those associated with the reform process of the CGIAR, in which he played an active role. Dr Roy-Macauley presented the Director General’s report, highlighting activities and achievements of the center’s management team during the preceding six months. The Board was informed of recent advances related to the Director General’s advocacy role. This included negotiations leading to the recent adherence of Ethiopia as the 26th member of AfricaRice; ongoing negotiations with the governments of Tanzania and Malawi to become members of AfricaRice; and working visits to Senegal on arrangements for the hosting of a high-level meeting on rice. The Director General reported good progress on resource mobilization with several donors, and also highlighted the center’s sustainable funding plans with respect to new funding opportunities. These included the development of partnership with the Office Chérifien de Phosphates (OCP), and the AfDB-funded Technologies for Africa’s Agricultural Transformation (TAAT) project. The Director General also formally presented the two newly recruited senior management staff, Mr Koen Geerts, Director for Corporate Services; and Dr Etienne Duveiller, Deputy Director General & Director Research for Development, who resumed duties, respectively in April and September 2016. Management briefed the Board on efforts being made in the rehabilitation of the center’s M’Bé station as more staff members relocate to the station. It stressed that funding was a major limitation in fast-tracking the rehabilitation process. The Board was, however, assured that most of the transition to Côte d’Ivoire would be completed by 2017. Management also briefed the Board on the business continuity of the Center in Benin. The Board was informed of the ongoing construction of a world class gene bank at the M’Bé station with funding from the AfDB and the Crop Trust as well as plans to build a soil testing laboratory of international standards at the M’Bé station, in collaboration with OCP. Finally, management briefed the Board on the progress made in the introduction of the decision support tool, RiceAdvice, which provides farmers with field-specific management guidelines for rice production in Africa. The 40th Board examined and approved various policy-related documents, including those on full cost recovery; the center’s overall security policy and standard operating procedures; and the document on the roles, responsibilities and procedures for selecting the Director General. Management should provide scheduled updates on capital development at the M’Bé station. The Board of Trustees met with the entire headquarters-based staff, during which the Board Chair informed staff members on the major outcomes of the 40th Board meeting. The Board Chair stressed that the center was going through some financial challenges leading to the Board’s recommendation that the center’s expenditures focus only on the most essential and highest priority areas. He called for prudence of all staff in the management of the center’s resources entrusted to their care. The Chair felicitated all AfricaRice staff for their continuing outstanding performance in sustaining the center as a Center of Excellence in spite of the prevailing financial challenges. The Chair expressed the Board’s confidence in the various steps being taken by management and also on the oversight being provided by the Board. He assured the staff members on the Board’s optimism regarding the improvement of the financial health of the center in the near future.